Very recently I discovered the Greek pasta dish Pastitsio. How did I ever get to be my age without tasting this fragrant, spicy, simple bowl of exquisite-ness? Traditional Pastitsio, which literally means “a mess”, is assembled and baked like lasagna with layers of pasta, cheese, a meaty lamb tomato sauce flavored with a hint of cinnamon and topped off with Bechamel, a white cream sauce. I like the lighter, simpler, somewhat “deconstructed” version on the menu at CityGate Grill. Our friends John and Mae own CityGate Grill, one of our favorite Friday night spots to decompress with good food and good wine after the craziness of the week. Pastitsio, which also happens to be one of John’s favorite childhood dishes, is my favorite item on their menu. The lamb and cinnamon together, which are so exotic and unexpected, are showcased in the Greek bolognese sauce prepared at CityGate. The bolognese is then tossed with piping hot bucatinin pasta and Bechamel sauce, sprinkled with Parmigiano Reggiano and served. 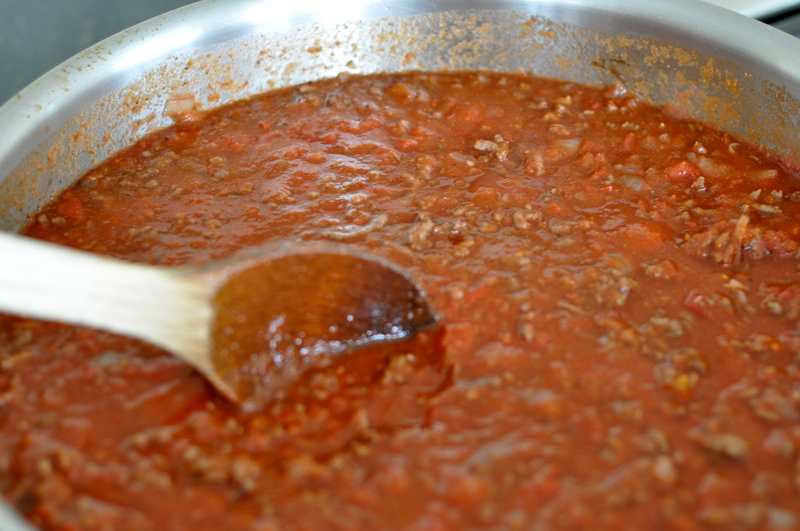 Someday I will corner the chef at CityGate and garner the secrets to his Greek style Bolognese sauce. It is so delicious and complex, I am guessing it involves lamb shanks and hours of braising. However, until then, here is a quick weeknight version using ground lamb we just can’t get enough of at home. I like using the ground lamb, however if feeling less adventuresome, ground beef can always be substituted. 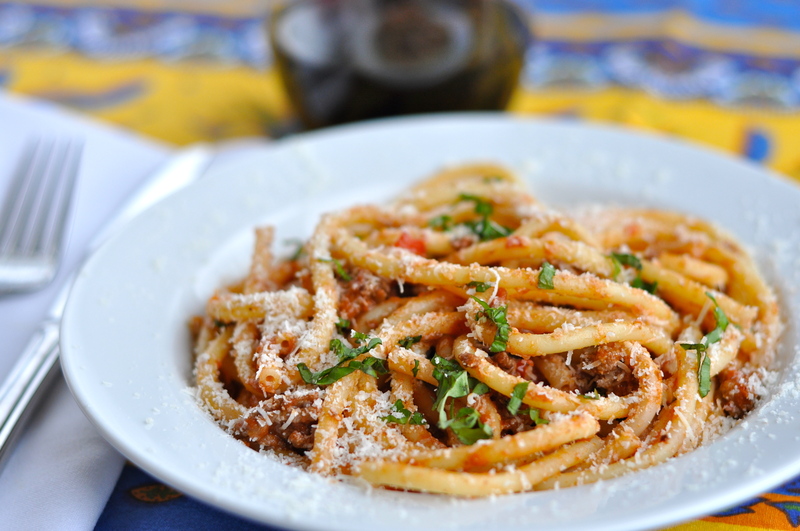 If you can find Bucatini pasta it is very fun to use in this dish. It is a thick, long noodle like spaghetti, but hollow in the middle like macaroni so it soaks up the sauce. 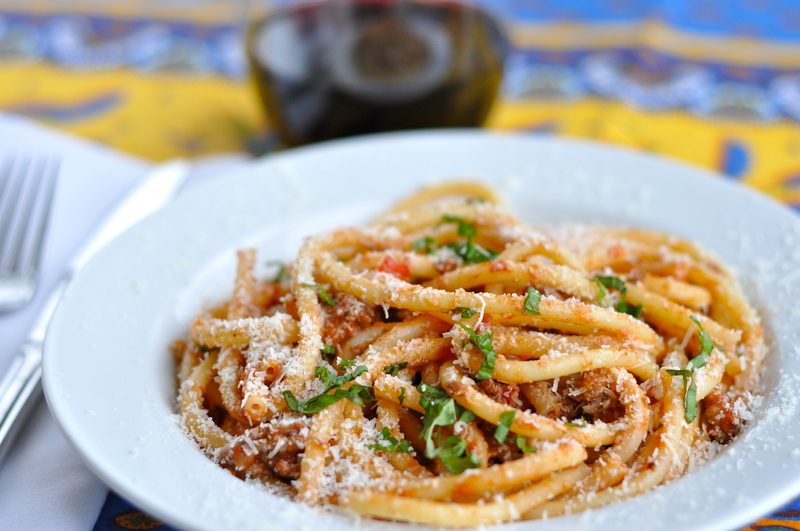 If you can’t find it then use a thicker, hollow pasta like penne so it holds up to the sauce. This comes together quick, so I hope it becomes one of your weeknight favorites too. Saute the diced onions and minced garlic in a big skillet with a little bit of olive oil. Add the ground lamb (or beef) and cook until nice and brown. Pour the wine into the skillet and scrape up any browned bits of meat. Bring to a boil, then lower the heat and simmer for 10 minutes. 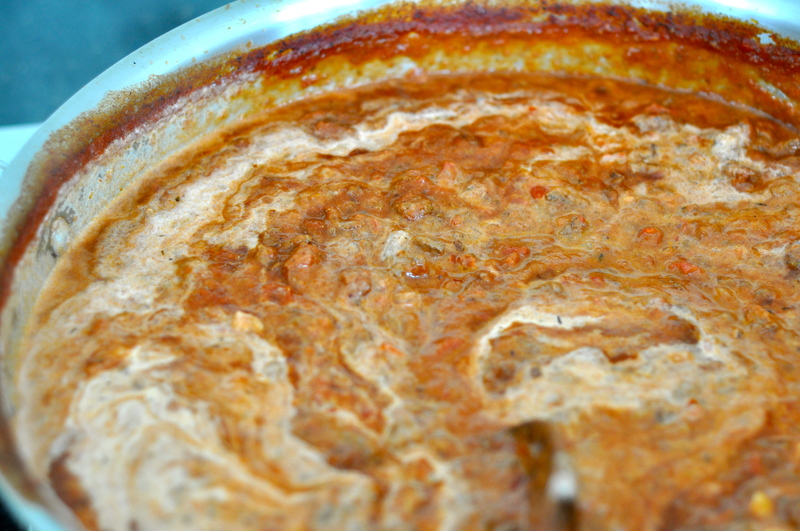 Add the crushed tomatoes, tomato paste, oregano, red pepper flakes, cinnamon and nutmeg. Salt and pepper to taste. Bring to a boil, lower the heat and simmer for another 10 minutes. Meanwhile cook and drain the pasta. Right before it is time to serve, swirl the cream into the sauce. Simmer a minute until it is piping hot, then toss the sauce with the drained pasta, freshly grated parmigiano reggiano cheese and chopped basil. Oh my!! This sounds and looks delicious. I had a similar dish at Babo’s in NYC once. The pasta is hard to find. Love your posts. You should put it in a book and sell it. Lamb on a weeknight = Fancy sounding. But I will try. If you say so. This is my favorite pasta dish — I enjoyed all the testing!!! !